Upper Cement Creek is the only “beginner” trail in the Cement Creek drainage, other than perhaps Lower Cement Creek (and it’s on the short side). It has received a major facelift a couple~three years ago and is pretty dang buff. To make a loop out of it, park at the Deadmans trail head, ride north up Cement Creek to the turn for northernmost intersection with Cement Creek (@3.5 miles – near Hunter Hill trail). Take a left on Cement Creek and juke down it all the way to Cement Creek road and the Deadmans’ parking area. 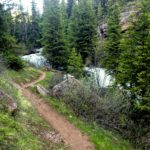 There are a few spots in the trail where beginners might be more comfortable walking their bikes, but for the most part the trail is about as buff as they get around here.